Carl has always had a passion for the natural world, this was apparent from an early age. It was during these formative years Carl began drawing and painting all the Wildlife he encountered during his time outdoors. Carl attended South Tyneside college studying an array of art based subjects including Design but his passion for Wildlife was always paramount and he chose natural history illustration as his specialist subject. Knowing that he had made the right choice he excelled in this subject. Carl later attended the University of Sunderland to study environmental Illustration, this involved close study and field work and helped Carl to develop great accuracy and sensitivity within his work which are trademarks of his work today. Carl regularly exhibits both nationally and internationally at private venues, country fairs and exhibitions and his paintings can be found in collections around the World and this includes having sold to clients in the Middle East, Europe, and America His reputation as a top wildlife artist has grown steadily over the years and his work is now much sought after. 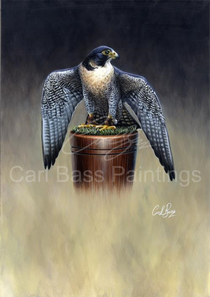 Carl has regularly exhibited at the British Falconry Fair in the Wildlife and Raptor Art Exhibition. 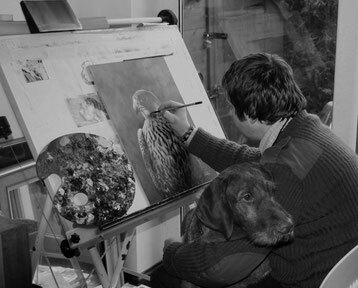 It was at this venue that his raptor art was given its deserved recognition within the falconry fraternity culminating in a sell-out show & Carl has since sold many paintings to various clients within the falconry community worldwide. Much of his studio time is taken up with private commissions whilst in between continuing to paint subjects that appeal to Carl. Carl welcomes all inquiries into existing pieces or private commissions; he also has a range of limited edition prints for sale. Carl's specialist subject is Birds of Prey this has derived from a passion for the sport of falconry which fascinated him from an early age and which he still practices today. Carl lives and works in North Yorkshire with his wife Katie, daughter Leia, and his trusty canine companion Archie.